Over 500 movers and shakers of the retail industry – large or small, established or brand new – were in attendance at Retail’s BIG Show held January 15-17 in New York City. Put on by the National Retail Federation, the world’s largest retail trade association, the event has been ranked as one of the top 200 trade shows in North America, as well as one of the 50 fastest-growing ones. 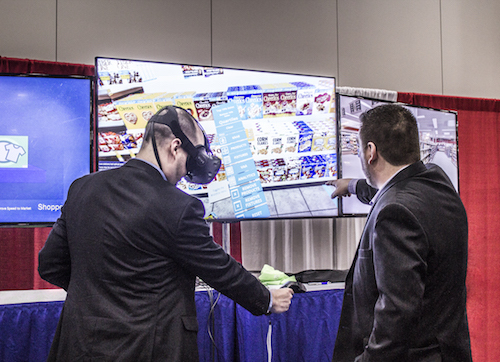 It was the place to be for anyone wanting to explore the latest in retail technology. As with any trade show, exhibitors were faced with the challenge of standing out and being memorable to attendees. 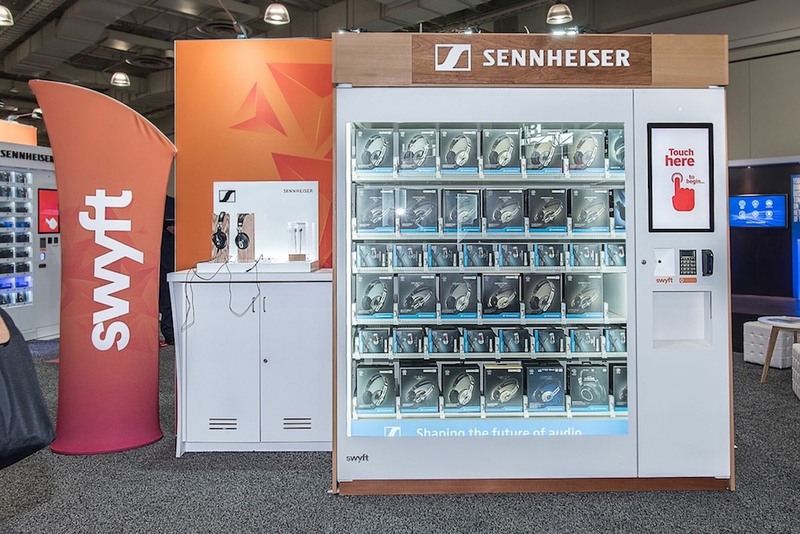 We did some exploring ourselves to see what caught our eye, and were impressed by several companies with creative, innovative retail tech solutions. Here are six of them and what we liked about each. “Pepper” is a humanoid robot manufactured by French robotics company Aldebaran Robotics and Japanese telecommunications company SoftBank. 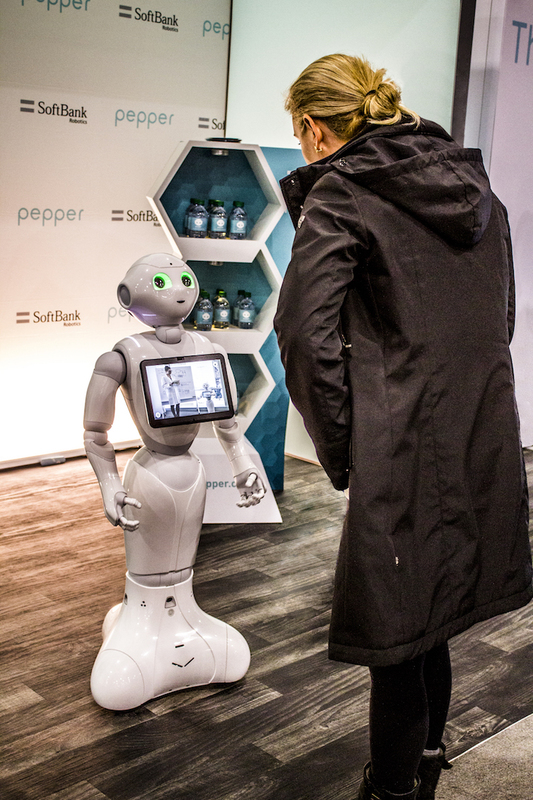 Pepper was introduced at a conference in June 2014 and immediately showcased in SoftBank mobile phone stores in Japan. Equipped with four microphones, two HD cameras and a 3D depth sensor, Pepper is highly interactive and can even identify principal emotions like joy, sadness, anger or surprise. As applied to retail, Pepper takes some of the burden off in-store salespeople by supplying customers with basic product information. A touchscreen display on Pepper’s chest puts customers in charge of the interaction, choosing what they’d like to learn about. It’s an engaging, interactive product that enhances the shopping experience and makes it memorable. What we like about Pepper: CrownTV is all about using digital tools to educate consumers and provide them with more product information, which is exactly what Pepper does. 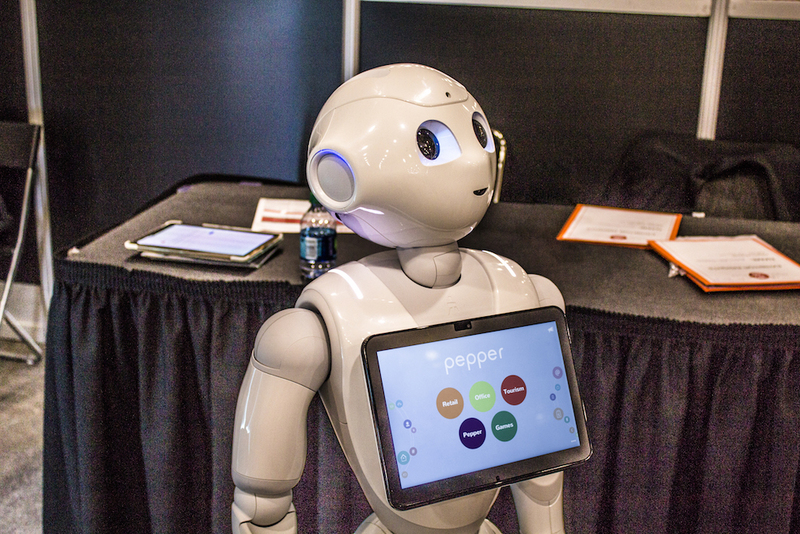 And although robots can sometimes make us humans feel uncomfortable or intimidated, Pepper is approachable, friendly and cute. Founded in 2012 by PayPal co-founder Max Levchin, Affirm partners with merchants to provide financing for consumers wanting to make a purchase in installments. The financing is simple and free of fine print, with a quick signup process, no hidden fees, total account security and flexible loan amounts. Affirm has partnered with brands like Casper, Wayfair, Expedia and more, and has seen huge growth over the past year. In 2016, they earned a spot on Fast Company’s Most Innovative Companies List. What we like about Affirm: Their disruptive, shake-things-up attitude. “The financial industry has managed to avoid significant disruptive innovation since the mid-90s, and we are working hard to change that,” says CEO Max Levchin. Affirm also has an admirable set of values revolving around transparency, putting people first, always innovating and keeping things simple. 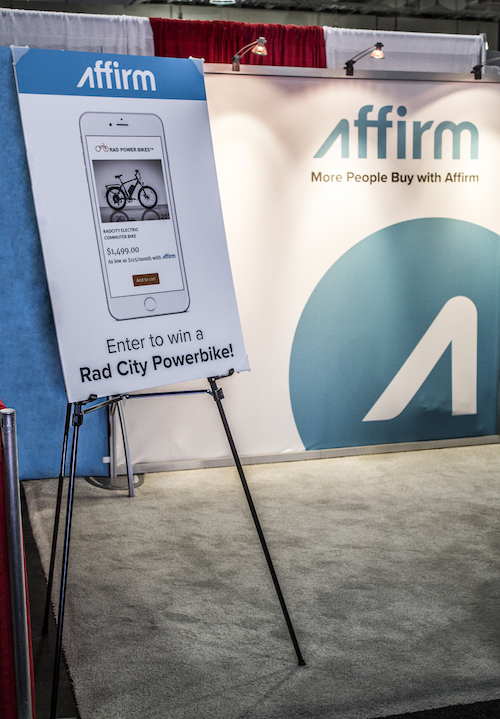 In a notoriously unchanging industry like finance, Affirm is a breath of fresh air. Virtual Reality (VR) technology usually makes one think of video games or roller coaster simulations, but who knew it also has applications in retail? InContext Solutions provides VR retail simulations for ideation, creation and modification of new in-store concepts. For instance, if a retailer wants to create a new store layout or bring in a new installation, he or she can wear one of InContext’s VR headsets and digitally see what the store would look and feel like. The experience is 3D and incredibly realistic – you feel as though you’re present in an actual store. So why VR for this purpose? What’s the advantage? Normally, creating new store concepts involves assembling physical mock stores, which requires a certain amount of space, inventory, time and money. InContext Solutions provides an alternative that cuts out the middleman. “Companies who embrace innovation are going to be the ones who can easily adapt to the changing needs of consumers,” he added. 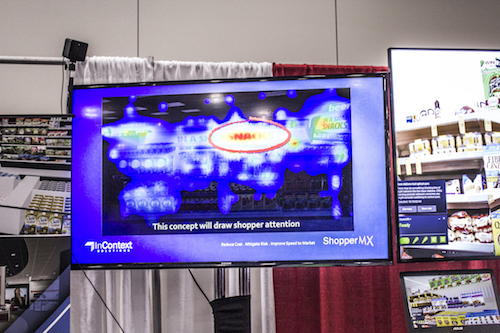 A heat map telling retailers if their store concepts will draw shopper attention. What we like about InContext Solutions: They’ve managed to digitize a retail process that’s normally conducted in person, which is pretty amazing. We also love the focus on gathering as much insight as possible for the retailer before they execute their store concept, ensuring high rates of success. 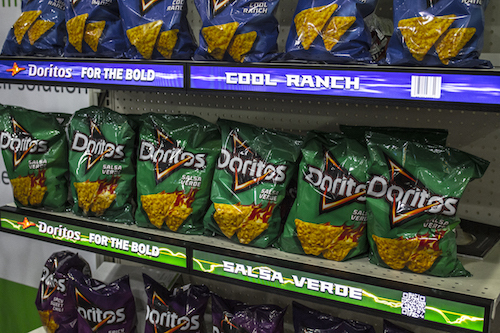 Those colorful strips you see on each shelf are actually dynamic digital displays! Established: Cloverleaf Media, a retail technology company, has been in business for around 10 years. Its shelfPoint product is brand new, announced on January 12, 2017.
shelfPoint is a new product by Cloverleaf, a retail tech company providing a scalable digital communications platform. shelfPoint allows you to “bring your shelf to life” by adding built-in digital screens. The high-definition LCD screens can display pricing, brand names and logos or advertisements for other products. Cloverleaf offers shelfPoint to both retailers and brands. 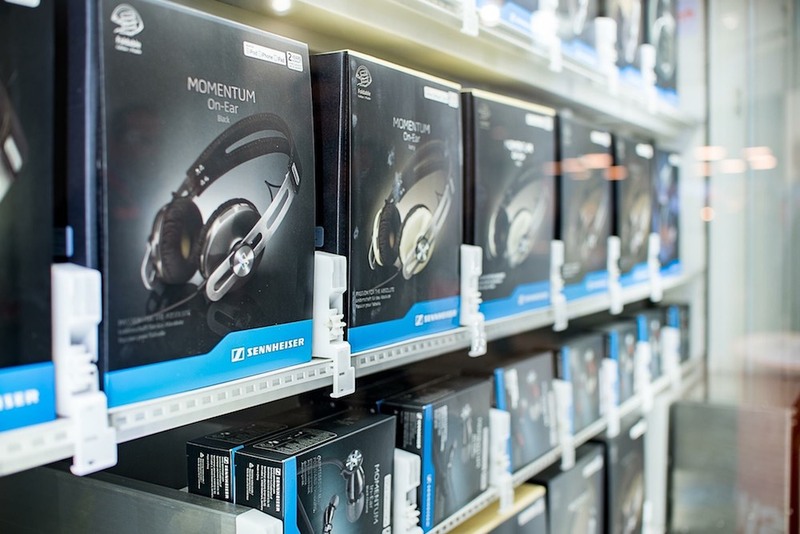 “In contrast to traditional aisles filled with yellow promotion stickers, brands using shelfPoint appeal to digitally minded shoppers through the use of unique video content. Early pilots have already shown double-digit sales uplift,” Gordon Davidson, founder and CEO of Cloverleaf, told CrownTV. shelfPoint is equipped with optical sensors which can gather anonymous demographic data on shoppers, including age, gender and major ethnic group. Emotional artificial intelligence technology can even detect shoppers’ facial expressions and sentiment, but without storing personal information or images. shelfPoint’s cloud-based insights platform can then analyze the data collected and provide an overview of key findings. “Cloverleaf’s shelfPoint solution is an affordable tool, with a positive ROI, designed to help retailers and brands better engage and understand their customers where the majority of shopping is done: in-store,” Gordon added. 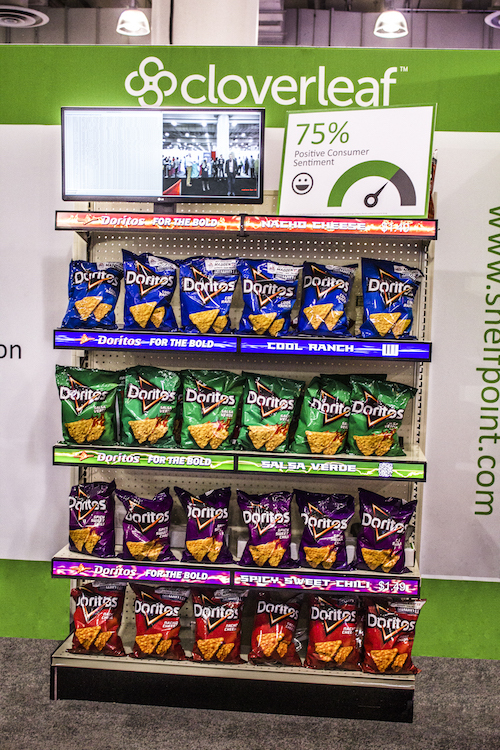 What we like about shelfPoint: It’s an innovative take on digital signage that we’ve never encountered before. There’s so much opportunity here for branding, advertising and customer experience. We see huge potential for positive ROI with use of this product. 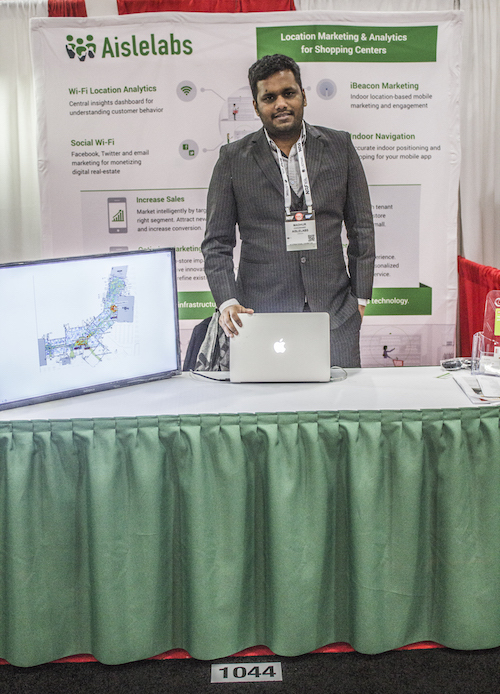 Aislelabs helps retailers understand shopper traffic patterns and behaviors inside and outside their physical stores. They create what they like to call a “smart store”, which is “equipped with continuous real-time sensing capability to understand traffic patterns, dwell times, and visitor preferences in a non-intrusive and trustworthy manner.” Retailers can gather information about shoppers whenever they log into the store’s wifi network, and that information is used to offer them tailored promotions or assistance. Aislelabs also uses its technology to reward loyal customers and entice new ones, for instance by sending a real-time email or mobile notification containing store information and specials to shoppers near a smart store. What we like about Aislelabs: The technology gives retailers so much powerful information to have at their disposal, while still respecting shoppers’ privacy. Aislelabs emphasizes that their product helps clients understand customer behavior “in ways never before possible”, reflecting an envelope-pushing, sky’s-the-limit culture of innovation. Swyft is bringing vending machine technology into the 21st century by making it fully automated, cloud-based and scalable. They provide both the hardware (the vending machine itself) and software components. The software allows the user to control their vending machines in real-time, using timely data to make smart merchandising decisions. Features include real-time dashboards, demand forecasting, coupons and promotions, traffic monitoring, geo-targeting and more. Swyft’s vending machines are also markedly smaller in size than the ones you may have seen before. This turnkey channel grows revenues, increases profits and enhances the brand image of retailers and brands, allowing them a highly scalable, omni-channel strategy that integrates with their existing mobile and eCommerce channels. What we like about Swyft: Swyft emphasizes that they provide the “highest ROI per sqft than any other retail solution”, showing their dedication to client success. They’re also with you every step of the way, from design to implementation to management. Another innovative technology that was present at NRF 2017? CrownTV’s digital signage solutions. Learn more about them and see their potential by requesting a demo today.